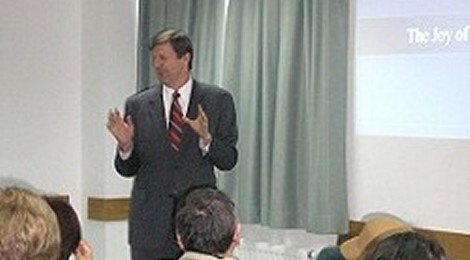 Several interesting new technologies related to genealogical research were presented on Saturday, January 23rd, 2010, in Zagreb, Croatia, by Steve Rockwood, Manager of People & Process Suport of the Family History Department of the Church of Jesus Christ of Latter-day Saints. The presentation was geared toward genealogists primarily interested in the research of Croatian records and ancestry. In the attendance were mostly members of Croatian Genealogical Society who attentively listened about several exciting technological prospects in the realm of genealogy research. Mr. Rockwood presented a new http://wiki.familysearch.org web place, where genealogists around the world can find information about research in various countries, but can also contribute and share their knowledge and experience. Wiki section about Croatia is also available, although not very rich with data. Croatian genealogists were invited to contribute and make the wiki place a valuable source of information and exchange. Also, a project of indexing vital records from digital images is introduced. More than 100 thousand volunteers regularly participate in reading sometimes hard to read records in various languages, and then entering data into computer, so that it can be searched by keywords. Genealogists versed in Croatian language were invited to participate in indexing of local records and help making those records available to the world.